Khalid Toukan, head of the Jordanian Atomic Energy Commission, said that “nuclear power is definitely one of the solutions to graduate from total dependency on oil and gas” after signing a $10 billion nuclear plant agreement with Russia’s state owned Rosatom company in Amman. The plant will be constructed in Amra, northern part of the kingdom, and it is expected to be completed by 2022. 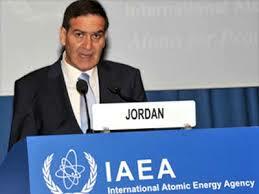 Jordan imports 96% of its electricity supply and heavily depends on Iraq for oil and Egypt for natural gas. The crises in these two countries for the past few years have cost Amman dearly and Toukan said that Jordan was losing $3 billion every year on average since the crises started affecting its supply. Upon completion, the nuclear plant is expected to be equipped with two 1,000-megawatt reactors and hopes are high that it will be locally fuelled. Toukan is “optimistic that the raw materials, the yellow cake, will come from Jordan” after discovering large uranium deposits within its borders in 2007. Reports have however stated that Jordan will be obliged to buy fuel for the reactors from Rosatom for a decade as part of the deal before seeking for any other supplier. According to Toukan, Jordan is aspiring to build “a state-of-the art nuclear power plant that will be a showcase for the region and other newcomer countries,” and the government is reported to control 51% of the stakes while the remainder goes to Rosatom. Rosatom’s director Sergei Kiriyenko said the deal is “a real strategic partnership” and engineers will take into consideration “post-Fukushima lessons” to build the plant. The company boasts of 70 years of experience in nuclear energy. Written by: Jaber Ali on March 25, 2015. Posted by Jaber Ali on Mar 25 2015. Filed under Energy, Headlines. You can follow any responses to this entry through the RSS 2.0. Both comments and pings are currently closed.